Return to the high seas for more Munchkin Booty action. Fight the Hammerhead Shark - and the Phillips-Head Shark, too. And greatest of all is the terrible Moby Duck! The Munchkins get lots of new weapons, new Ships, and a new Class: the Explorer. He gets a Treasure when he helps in combat, and he can pull cards back into his hand! 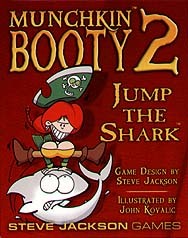 This is an expansion for Munchkin Booty. It is not a stand-alone game.